Although the summer was not half as long as I hoped it would be – and I could use a lot more of summer heat – I really enjoyed cooking outdoors. After one year of indecisiveness I finally jumped into action and spent my money on a Big Green Egg, the Rolls Royce of barbecues (or, as they would like to say, ‘smoker and grill’). This green Egg is like a large ceramic oven in which you put chunks of charcoal. The heat is incredible, it will rise from 0 to 350 Celcius in 20 minutes time. And when you think this takes expertise or careful fanning with newspapers on my part, you are wrong. After lighting you just close the lid and pry all vents open, then it will heat easily without any effort. Anyone can do it! I realize there is always a lot of fuss about barbecueing, also involving some male / female roleplaying. It seems men want to kindle fires and slap on the big steaks, while women prepare salads and desserts and nibbles. Also, when buying my BBQ, the salesman kept looking at my boyfriend when he talked instead of at me (although this also happens when you go out to buy a computer). Why would that be? There is something extremely comforting about making your own fire and then cooking on it. It feels so basic and simple. One can hardly call it cooking, just put on some stuff – red peppers, zucchini, eggplants – and they turn yummy and tender and filled with the charcoal flavor, perfect to toss with some olive oil and seasalt. Put on some meat or fish – and again- when they are done they are succulent, smokey and irresistible. In two months’ time, I have made salmon, sea bream, red mullet, potatoes, eggplant, zucchini, tomatoes, onions, pork tenderloin, pork chops and steaks. 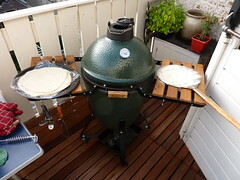 One other really exciting thing is the BGE works as a bread or pizza oven. Although this takes an extra part known as a plate setter, which is basically a very thick ceramic (pizza) stone with 3 feet so the air can circulate, breads and pizzas are supposed to come out great. I have only tried to make pizzas up to know, and the last batch turned out wonderful. A crispy crust and oozing mozzarella with tomato on top. It needs more exploring! The BGE can get so hot some Indian foodies tried to make chicken tandoor in it, using it as a tandoor. And what would happen if I tried to make Chinese style oven duck?